Burton Richter, a renowned Stanford physicist and Nobel Prize winner, died Wednesday, July 18 in Palo Alto at the age of 87. Richter is best known for helping to discover a new particle that proved the existence of a fourth quark, known as the charm quark, for which he was awarded the Nobel. Physicists believe that matter is made up of two kinds of fundamental particles, quarks and leptons. To date, physicists have located six types of quarks, charm being one of them. "That discovery upended existing theories and forced a recalibration in theoretical physics that reverberated for years," said a statement issued by Stanford University. Born in New York in 1931, Richter leaves behind a prolific legacy in the physics field, including helping to design the world's first particle collider at Stanford University’s High-Energy Physics Laboratory in the 1960s. Richter obtained his Ph.D. in physics from the Massachusetts Institute of Technology. 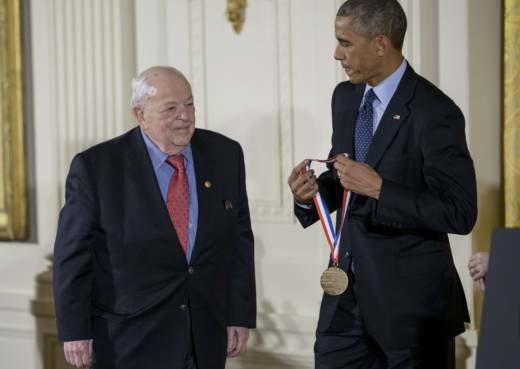 His experiments, which laid the groundwork for future discoveries, earned him many honors including the National Medal of Science, the nation’s highest scientific honor, in 2014. Richter was a member of many science organizations including the National Academy of Sciences and JASON, an independent group of scientists that advises the U.S. government. He is also the former president of the International Union of Pure and Applied Physics. Richter also served as a member of the U.S. Department of Energy's Nuclear Energy Advisory Committee. He is survived by his wife, Laurose, children Elizabeth and Matthew Richter, and grandchildren Allison and Jennifer Richter.